It is Winter Carnival in Quebec City, bitterly cold and surpassingly beautiful. Chief Inspector Armand Gamache hascome not to join the revels but to recover from an investigation gone hauntingly wrong. But violent death is inescapable, even in the apparent sanctuary of the Literary and Historical Society- where an obsessive historian's quest for the remains of the founder of Quebec, Samuel de Champlain, ends in murder. Could a secret buried with Champlain for nearly 400 years be so dreadful that someone would kill to protect it? Although he is supposed to be on leave, Gamache cannot walk away from a crime that threatens to ignite long-smoldering tensions between the English and the French. Meanwhile, he is receiving disquieting letters from the village of Three Pines, where beloved Bistro owner Olivier was recently convicted of murder. 'It doesn't make sense,' Olivier's partner writes every day. 'He didn't do it, you know.' As past and present collide in this astonishing novel, Gamache must relive the terrible event of his own past before he can bury his dead. This novel was very well done. The two separate tales of murder were intertwined so flawlessly. I think this may have been my favorite Three Pines story thus far. I applaud Louise Penny for her ability to bring these characters to life in such a manner as to make them living, breathing personalities. I know the series will someday end as all good things do, but till then, onto the next! I have enjoyed everyone of Louise Penny's books. Ralph Cosham breathes such life into the characters that it is easy to make a leap from my reality into the lives of Penny's characters. I love this series and can't wait until the next book is out. The characters are fully developed and become more so with each novel. Anyone reading the books will want to live in Three Pines. 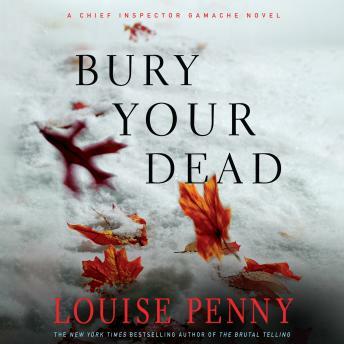 Louise Penny writes with a wonderful sense of humor and the mysteries remind me of Agatha Christie but with more depth. I love the reader, as well. His voice is wonderful and he makes the characters come alive. I loved this book. This was my first experience with Chief Inspector Gamache, and what a great way to get to know him. The twists and turns are not contrived, and certainly kept the suspense going. I found I was going under the speed limit on the highway at one point because not only was I deep into the book, but also because I didn't want to get home before the book ended.